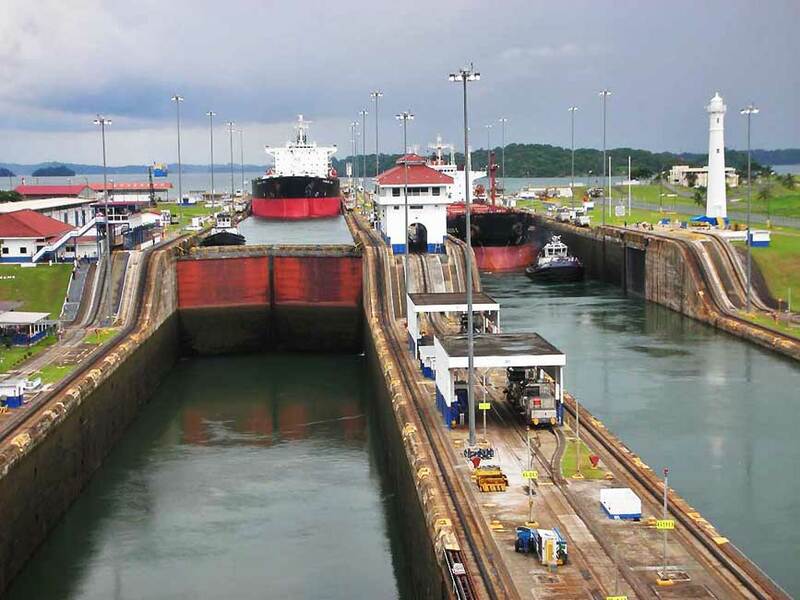 One of the most popular things to do for people who visit Panama is a trip to the Miraflores Locks. 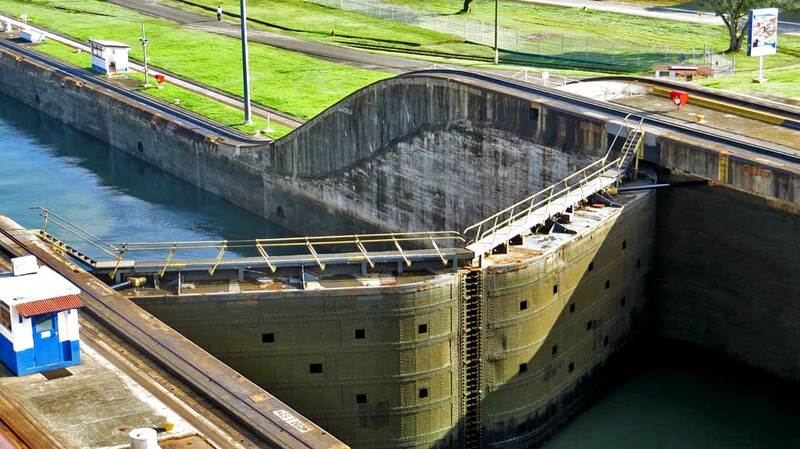 If you transit the Panama Canal you will go through these locks near Panama City. If you aren’t on a cruise ship, you can reach the Miraflores Visitor Center in about 30 minutes from downtown Panama City. At the Miraflores Visitor Center, see displays about the construction of the Panama Canal. Then go outside on the Observation Deck to see ships pass through the Miraflores Locks. The Observation Deck is right along side the canal, so it’s easy to see the locks working and to exchange a wave with cruise ship passengers going by. 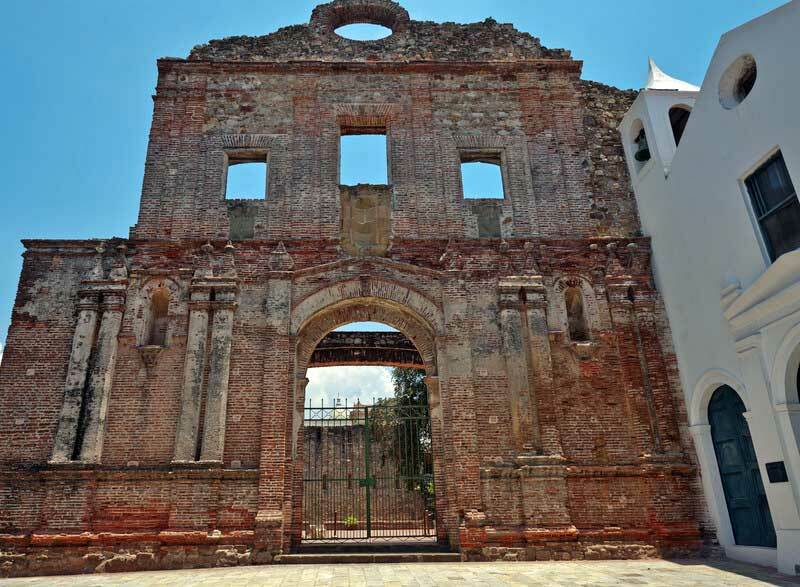 One of the best things you can do when you visit Panama City is to spend time at Casco Viejo. Casco Viejo or Casco Antiguo is the old colonial quarter of Panama City. 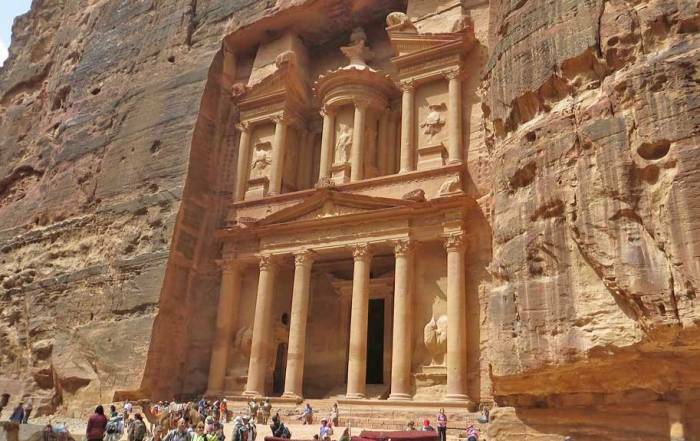 It’s a UNESCO World Heritage Site. Create your own walking tour of Casco Viejo. 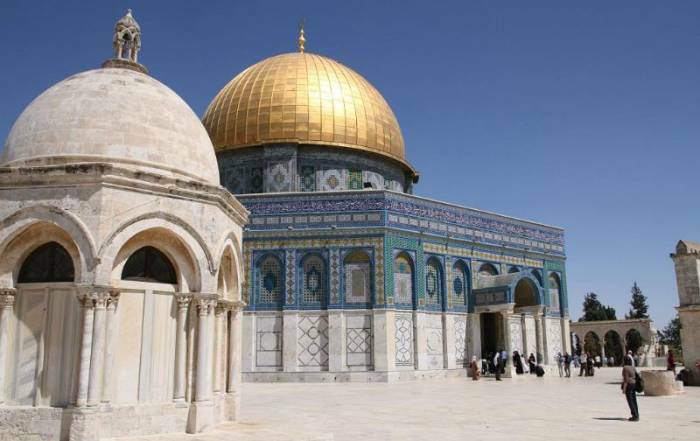 Here you will find lots of churches, plazas, museums, the National Theater and the Presidential Palace. 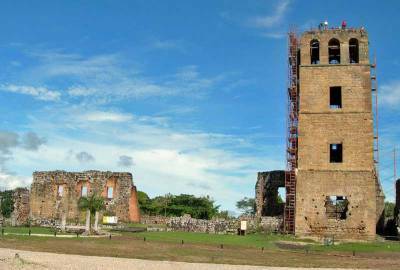 You can also see the ruins of the Compania de Jesus and Santo Domingo churches. Then extend your visit to Casco Viejo by strolling the Las Bovedas waterfront promenade. Stop at France Plaza on your walk. Enjoy views from Las Bovedas back over Panama City. Visit a wine bar or a coffee shop. 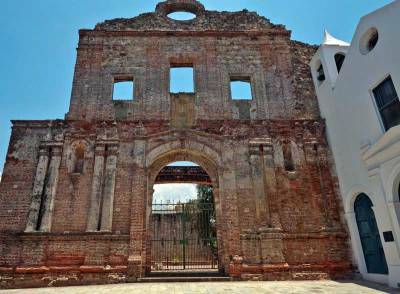 Panama Viejo is the original Panama City, which was destroyed by the Englishman Henry Morgan and his men in the 1671. 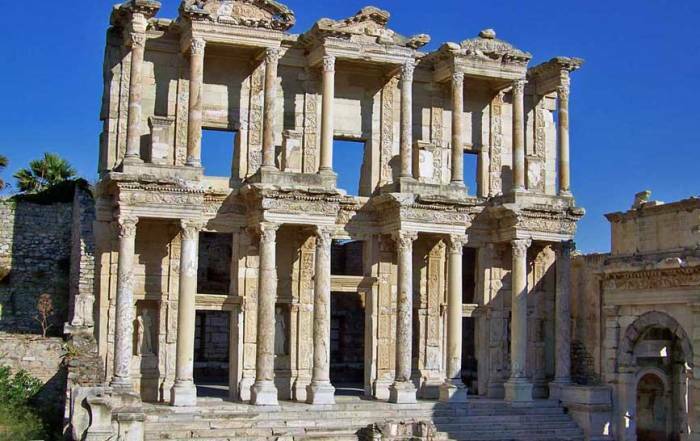 The ruins cover 57 acres (23 hectares). Panama Viejo is at the far eastern edge of Panama City. Don’t get it confused with the popular colonial district of Casco Viejo in the downtown area of Panama City. Bike or stroll the Amador Causeway. The Amador Causeway links the islands of Naos, Flamenco and Perico to Panama City. The causeway also marks the entrance to the Panama Canal. Along the Amador Causeway you will find the Biomuseo museum and a Smithsonian Tropical Research Institute. The Bismuseo stands out because of its building block exterior, painted in bright colors. Look out into the Gulf of Panama, where you can see lots of ships at anchor waiting their turn to transit the canal. Metropolitan Park – experience a rainforest within the city limits. Try the Canopy Crane Tour. Centro Cultural Mi Pueblito – Several acres dedicated in Indian culture with life-size replicas of rural villages from Panama’s past. Ancon Hill – views over the city from this rainforest park. Urraca Park (Parque Urraca) – in the heart of downtown. Shopping malls are popular in Panama City. Albrook Mall is the largest mall, with hundreds of shops. The Multicentro Mall is attached to the Radisson Decapolis hotel downtown. The Multiplaza Pacific Mall is downtown too, close to the Multicentro Mall. Gamboa is one of the most popular destinations outside of Panama City. It is about 45 minutes north of Panama City and just over an hour from Colon. Ride the Gamboa Aerial Tram. 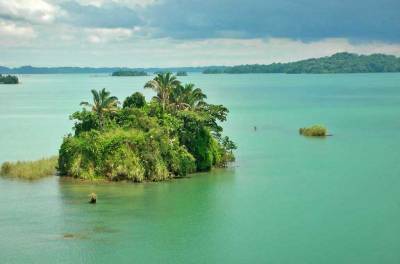 Take an excursion to Monkey Island and Sounds of Silence Island to look for monkeys, sloths, crocodiles and turtles on the shores of Lake Gatun. You can take the Panama Canal Ferry between Gamboa and Panama City. The ferry takes about 7 hours, but isn’t on our recommended list. Cruise passengers on a half transit use this ferry so they can say they did a full Panama Canal Transit. View the locks from the observation deck at Miraflores instead and save a lot of time. 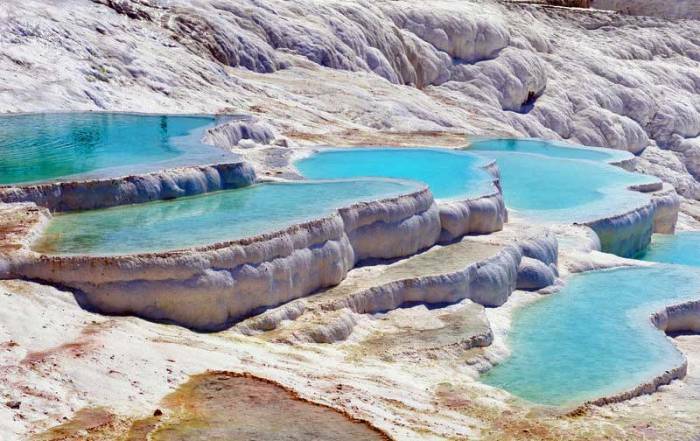 Anton Valley is the world’s only inhabited dormant volcanic crater. You will find Anton Valley about 2 hours west of Panama City. There are 500 species of birds that live in Anton Valley. See the Painted Stone and the Chorro de Macho Waterfall. Enjoy many unique restaurants, plus canopy rides and museums. Isla Taboga – for its beaches and charter fishing about 20 minutes by boat from Panama City. Soberania National Park – rainforest on the banks of the Panama Canal, about 20 minutes northwest of Panama City. Take a more distant excursion to the Chiriqui­ highlands, Bocas del Toro and Isla de Coiba or Comarca de Kuna Yala. The Panama Canal is a 48 mile (77 km) lock system that allows ships to pass between the Atlantic and Pacific Oceans without going around South America. The United States successfully finished the Panama Canal in the early 1900s and kept control of any Panama Canal Transit for decades. In 1999 Panama took over control of the canal. 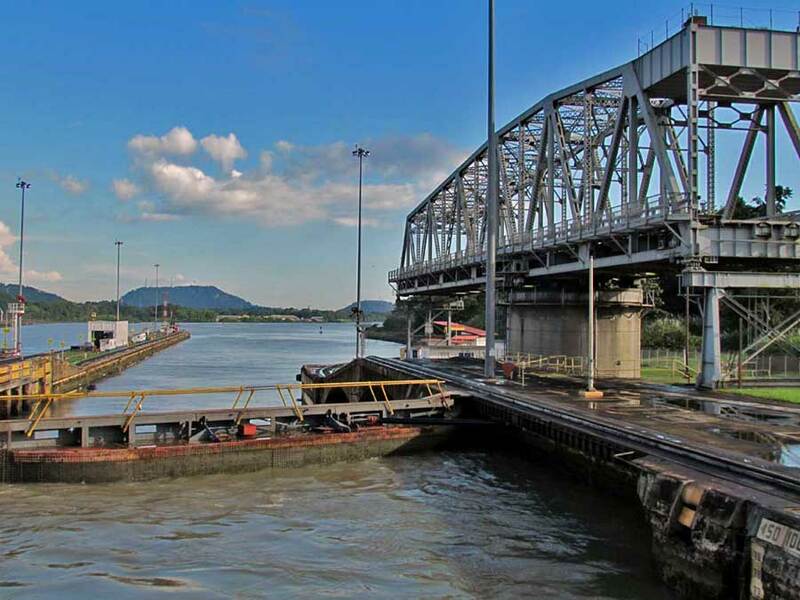 The canal makes use of the natural flow of water from Gatun Lake, in the middle of the canal, to raise and lower ships in both directions. 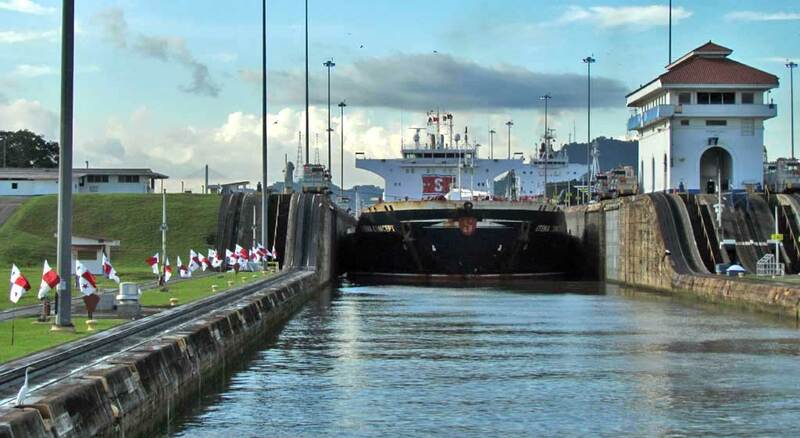 A Panama Canal Transit takes 8 – 10 hours, including the Miraflores Locks, the Pedro Miguel Locks, the Gaillard Cut, Gatun Lake and the Gatun Locks. You might think the canal would run east/west, but the country of Panama actually runs east / west. So, the canal basically runs north and south between the Pacific and the Atlantic. 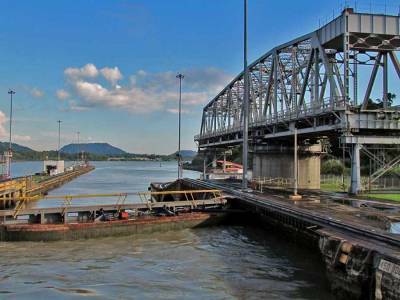 During a Panama Canal Transit, you will pass under the Bridge of the Americas near Panama City and under the Centennial Bridge a bit farther north. You can buy a Panama hat in Panama City, but it’s probably made in Ecuador. Panama hats were first made in Ecuador and the highest quality ones are still made there. The popularity of the Panama hat was based on the need to supply foreigners with protection from the sun during construction of the Panama Canal. Early visitors also bought the hat for their Panama Canal Transit. Now the Panama hat is a style recognized all over the world. People get to Panama by air and cruise ship. Tocumen International Airport is about a 20 minute cab ride from Panama City. Cruise ships arrive from the Pacific and Atlantic. Cruise ship passengers usually transit to Lake Gatun and then tender off the ship for a shore excursion. Many cruise lines offer what they refer to as a Panama Canal half transit. 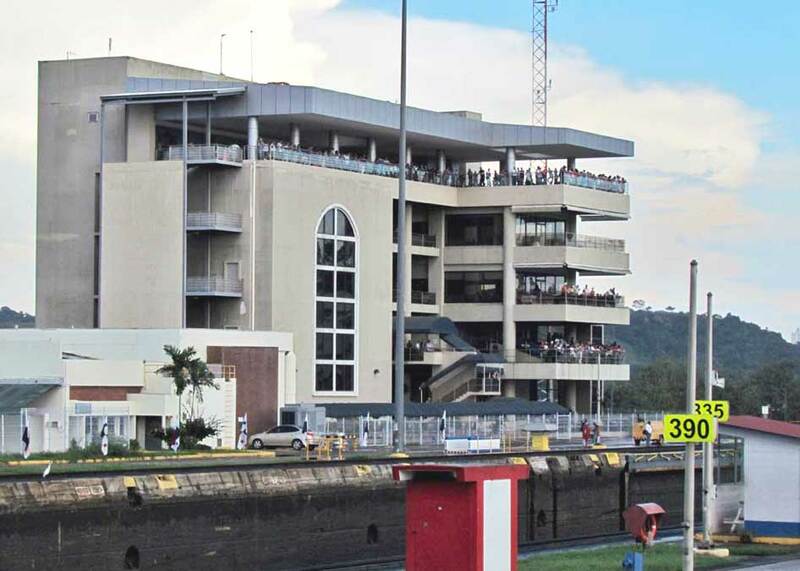 These cruise ships keep passengers on board from Colon through the Gatun Locks to Lake Gatun. Passengers then disembark for shore excursions. 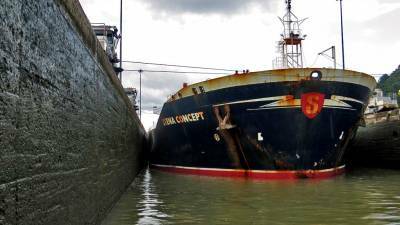 The ship turns around, going back through the Gatun Locks to wait for its passengers at the docks in Colon on Limon Bay. A half transit only covers a small section of the Panama Canal and never gets near the Pacific. The big advantage is that your cruise returns to the Caribbean instead of making the very long journey along the Pacific to the United States. Taxis are the primary means of transport in Panama City and they are reasonably priced. In Panama City, a Hop-on-Hop-Off Tour offers excellent routes on their red double-decker buses. The Hop-on Hop-off covers all the major points of interest. Stops include the Miraflores Lock, Casco Viejo, several malls and the Amador Causeway. 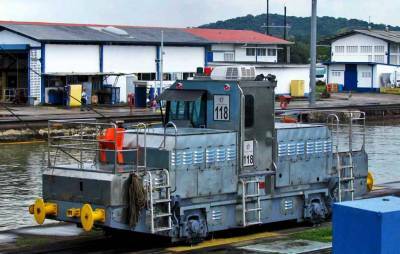 You can take the Panama Canal Railway between Panama City and Colon. Ride one way or return in a 1930s train that has dome cars. 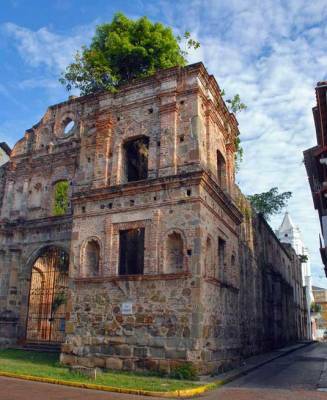 In Colon, take a side trip to the Portobello UNESCO World Heritage Site. 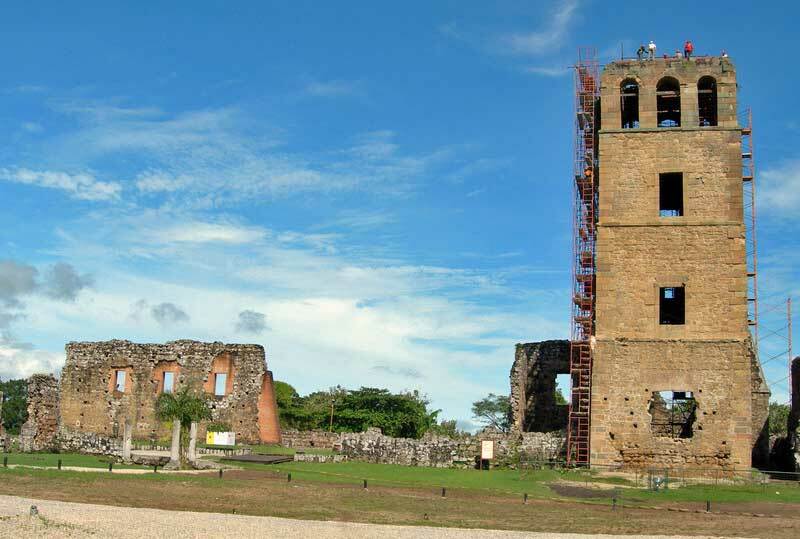 See the old Santiago Fort ruins and Fort Jeronimo in Portobello. 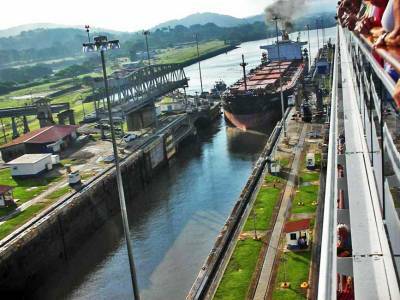 Cruise ship passengers must book the Panama Canal Railway directly through their cruise line. 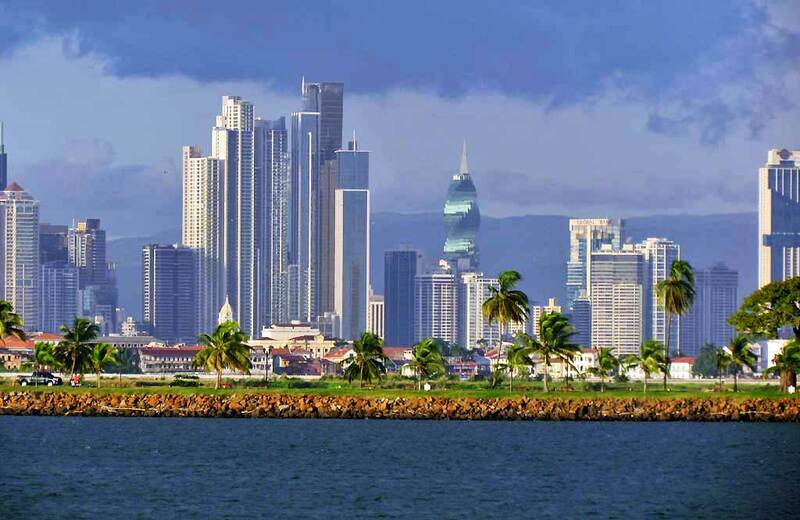 The dry season in Panama is December to April, which makes it the best time to visit Panama. This is also the summer vacation period for locals and the time of year when schools are not in session. In the Green Season, from May to November, Panama weather has daily rainfalls. Rainfall can exceed 16 feet per year in some locations in Panama. The prevailing winds flow to the west and north into the Caribbean, so Panama is not subject to hurricanes. The country never goes on Daylight Savings Time and because it is near the equator, the days are always 12 hours long. That means Panama weather temperatures do not vary throughout the year. 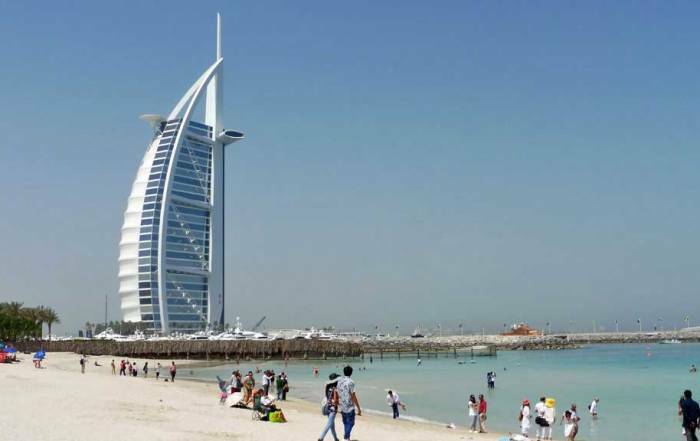 Expect average highs of around 95 F (34 C) and average lows of 70 F (20 C) in any month. Most tourists who visit Panama will find that there aren’t any visa requirements as long as you are stay less than 6 months. Proof of exiting travel arrangements may be required at your point of entry. Check your specific country at VisaHQ. For a list of exempt countries, visit Project Visa. The official currency of Panama is the Balboa. The exchange rate is set exactly equal to the US dollar. The US dollar is commonly used throughout the country and change is often given in US dollars even if you originally pay with Balboas. Major credit cards are widely accepted too. Radisson Decapolis Panama City – downtown hotel attached to a casino & the Multicentro Mall. Gamboa Rainforest Resort – 30 minutes from Panama City on the Chagres River and Panama Canal. Enjoy river view suites set in 240 acres of lush tropical forest with over 380 varieties of birds. Royal Decameron Golf, Beach Resort & Villas Panama – beach front property and golf villas located 90 minutes from Panama City. Westin Playa Bonita – luxurious all inclusive overlooking the Pacific, the Panama Canal and Punta Bruja nature reserve. 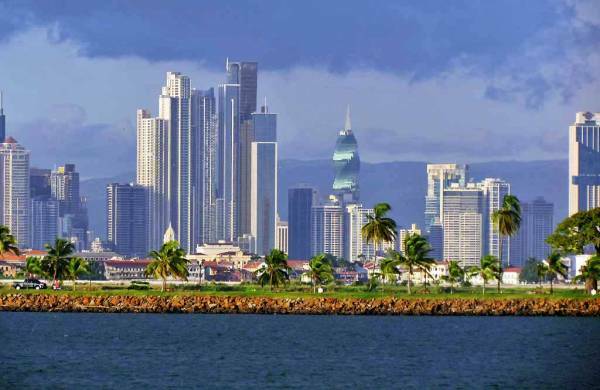 Panama City is the capital of Panama and its largest city. Around a million people live there. Panama City is on the Pacific Ocean at the beginning of the Panama Canal. The Spanish founded Panama City in the early 1500s, but the city was destroyed by English privateers led by Henry Morgan in 1671. Panama Viejo marks the old town site. Be careful not to confuse the ruins of Panama Viejo with the later colonial architecture at Casco Viejo. Also, don’t get Panama City, Panama mixed up with Panama City in Florida.